Yeah. Sorry, I didn't see that folder. Can you enable source viewing only without having to create a project? I like the editor very much and find it a bit annoying whenever I want to quickly view an ASM file. codestar: Thank you very much! Please follow the instructions in Setup.txt file. The 'SysLink' control is already implemented. The 'SysLink' control appeared in the tool box but it was not implemented. As a result, Easy Code crashed when trying to add a 'SysLink' control. Thanks for your kind words about EC and sorry for the inconveniences. I will check the bug you report on my Windows 10-64 in order to fix it. EasyCode, can the source be opened? After doing some testing, I cannot reproduce the bug you reported on Windows 10-64. May I know what shortcut key you are using for the calculator? idle, No, at the moment the source will not be opened. I do not understand the second part of your post. Maybe you mean a non-existing folder should be created without asking? It think include entry should be formed automatically. Well, EC cannot guess where you have the necessary tools. Since you must have FASM anywhere in your hard disk(s) in order to build FASM projects, is it so difficult to set the right paths? Well, yes, and the same logics can be applied to GOASM, MASM, etc., but the IDE cannot do it all. To configure FASM takes very little time and, once configured, you do not have to worry anymore. The 'BackColor' property has been added to the 'SysLink' control. Five new items have been added to the 'Help' menu. Those items are customizable and allow you to define up to five more help files that may be started from Easy Code. Please see the 'Configuring other help files' topic in the Easy Code help file (last part of the 'Settings' section, 'Help' tab). Shortcut keys available in some keyboards made Easy Code to crash if it was running without administrator priveleges. This problem was related to the WM_APPCOMMAND message and has already been solved. Fixes a severe bug that made Easy Code to crash when the code editor processed some characters. The path for 'Help #4' custom help (Tools-->Settings menu, 'Help' tab) was never saved. The default code for a new module, "Project-->Add Module" menu, was wrong (classic projects only). 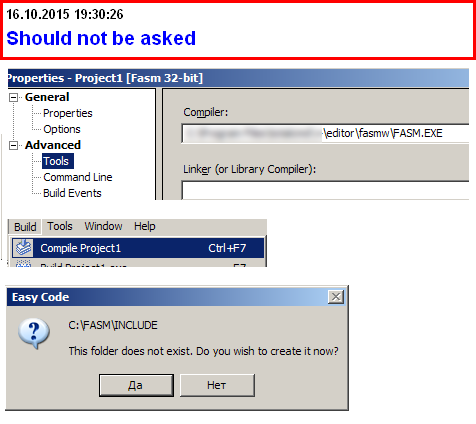 Extern variables and procedures, that is, those declared in another window or module, were reported as "not found" when building the project (only FASM visual projects). Custom help items 'Help #1' to 'Help #5' (Tools-->Settings menu, 'Help' tab) also accept a web address (URL). New language files for Chinese, both traditional and simplified, translated by Jason Jiang (already available in previous version 2.00.0.0004 but not documented). New example project for FASM, 'EC Player', a nice CD player. New example project for GOASM, 'EC Player', a nice CD player. In FASM visual projects the 'App' object ([App.Main], [App.Instance], etc.) was not recognized in any window or module other than the main window. Fixes some errors in the 'shell32.inc' and 'winmm.inc' files of the Easy Code "Include\Fasm" folder. "e cannot be loaded separately. Please generate a n ew project...."
I am really sorry for the inconveniences. Are you double-clicking the "EasyCode.exe" file from the "\EasyCode\Bin" folder? If so, what version of Windows are you running? By double clicking the exe, that message doesn't appear, though. Instead, a New Project dialog will appear. This is what EC is supposed to do. Now you can create a new project or close the "New Project" dialog and load the example projects. However, I will see what happens if EC is ran from the command prompt.